Writing and reviewing your notes helps information stay in your memory longer. Cornell Notes are a great tool for learning! Cornell NotesWhy take notes? Research indicates that unrehearsed information is forgotten in as little as 20 seconds and almost ½ of what is learned is forgotten within an hour. Taking notes using the Cornell method is a great way to capture the most important information while reading texts or listening to a lecture. Furthermore, it helps you retain more of what you learn. Cornell notes were originally developed by Walter Pauk at Cornell University in the 1950’s in response to his student failing his classes. By changing the way students were required to take notes in his class, Pauk was able to help his students improve their grades. 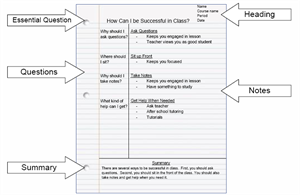 Cornell notes include a section for questions, notes, and a summary. While reading, take notes one section at a time. Look away from the text and take notes from memory. Turning the essential question of your notes into a topic sentence for your summary. Turning each main idea written in the notes section into complete sentences in the summary section. Taking time to do this gives you one more opportunity to interact with your notes which will help you increase your retention of the content. Do this within 24 hours of taking the notes. Fold your notes so that the questions are on one side and the main ideas and details are on the flip side. Read the question. Try to answer the question without looking at the notes section. Once you answer the question, flip to the notes section to check your answer. If you answered completely, move to the next question. If you did not answer the question completely, mark the question so that you know you need to spend more time on it. Repeat the step above for each question. Short, fast, and frequent review of notes is better than studying them once for a long period of time.